VBF 20th Anniversary Gala and Conference A Huge Success !!! 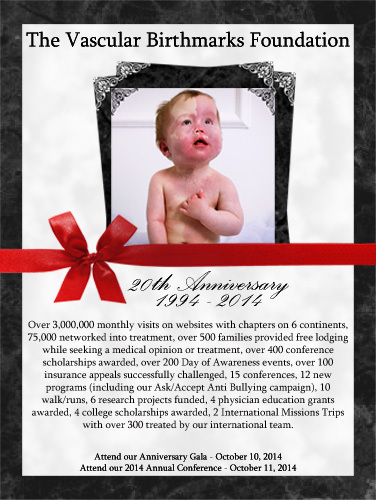 On Friday, October 10, 2014, the Vascular Birthmarks Foundation held a celebratory gala in commemoration of our 20 years of helping families affected by vascular birthmarks. The gala was held in New York City’s Times Square at the Hudson Theater. We are pleased to announce that our Co-Chairs of this gala were Frank and Barbara Catalanotto and Dr. and Mrs. Rosen. Nearly 230 people joined us at this event as we relived our 20 year history. It was an emotionally charged evening as we reminisced and heard first hand testimony from parents and teenagers that were networked into treatment over the years as a result of VBF. Dr. Linda so eloquently brought us back to the early years and some of her struggles and triumphs that made VBF what it is today. There was not a dry eye in the house! Dr. Linda’s daughter, Christine Shannon who once had a massive hemangioma on her lip, beautifully sang Leonard Cohen’s Hallelujah. She which was accompanied by Dr. Milton Waner and Madelaine Pizzarelli on guitar and Anna Joyce and Coco Bolinger as chorus. Anna and Coco also once had large hemangiomas and were networked into treatment by VBF. In addition, VBF honored Dr. Martin Mihm as its 20th Anniversary Physician of the Year. Dr. Roy Geronemus was the recipient of VBF’s 2014 Humanitarian Award. Natalie and Brian Bolinger received the President’s Award for outstanding service in fundraising for VBF for over 10 years. Service awards were also presented to Wendy Olin, Jennie Drury, and Carla Mannix. During her remarks, Dr. Linda also recognized many other very important people that made VBF’s history possible. The evening concluded with entertainment from the very funny and talented comedian Mike Stankiewicz. Mike has a port wine stain and has been receiving treatment from Dr. Roy Geronemus. On Saturday, October 11th, we held our 20th Anniversary Conference at the Lenox Hill Hospital in New York City where nearly 300 people were in attendance. Dr. Robert Rosen, Dr. Roy Geronemus and Dr. Gregory Levitin were the conference co-chairs. World renowned expert physicians in the field of vascular birthmarks and related syndromes donated their time to lecture on the latest research and treatment options. These same experts also held clinic sessions where families received an accurate diagnosis and treatment plan. There were over 27 physicians who donated their time and services. In addition, there were over 150 clinic appointments. VBF also offered free support groups, dental clinics, daycare services, make up sessions and insurance sessions. The VBF 2014 20th Anniversary Conference was dedicated to the Catalanotto Family in recognition of their continued support of VBF. VBF would like to acknowledge Dr. Roy Geronemus and his staff for providing free laser treatments to many conference attendees. Dr. Geronemus and his staff cleared their schedules for two days (October 9th and October 13th) in order to provide these free treatments! We would also like to thank our sponsors: Syneron, Pierre Fabre, Cynosure, Cutera, Terumo, the Vascular Birthmarks Center, Estee Lauder, and the Wicker Family. A special thank you goes to the Catalanotto Family, Dr. and Mrs. Rosen, Dr. Gregory Levitin and VBF’s Medical Directors, Dr. Stuart Nelson and Dr. Martim Mihm. We would also like to acknowledge Dr. Linda for her 20 years of dedication and hard work, all of the physicians that donated their time and expertise, VBF’s Board of Directors, the VBF staff, and to all of our volunteers and supporters. May God bless us with many more years of providing support to families from all over the world who are affected by a vascular birthmark!